Inside the timeless and lavish “Napoleon: Power and Splendor” at VMFA | Arts and Culture | Style Weekly - Richmond, VA local news, arts, and events. President Donald Trump may seem unique in how he employs Twitter to market his political brand, but Napoleon was using media platforms for a similar purpose 200 years ago. He did it from 1804 to 1815 with the visual culture of 19th-century French society: opulent portraiture, ceremonial costume, imperial palaces and furnishings, and lavish decorative art. "We think of him as an isolated figure," says Sylvain Cordier, curator of early decorative arts at the Montreal Museum of Fine Arts. "I don't want to say [that's] a lie but it's definitely a forgery." Cordier, who conceived of the traveling "Napoleon: Power and Splendor" in 2012, has studied the Corsican for more than 15 years. He says that the emperor's propaganda-churning machine required an imperial court: 3,600 people directed by six grand officers. That carefully orchestrated narrative, traced through 200 objects on loan from more than 60 institutions and delivered to the museum by more than 16 carriers, is on full display at the Virginia Museum of Fine Arts. But there's another nuanced story: the tragedy of Napoleon as a person, the man behind the myth. These two stories unfold in 11 rooms that highlight portraiture, hunting, religion, public feasts, throne rooms, the emperor's two wives, his private apartments, his architectural vision for Paris and his exile. Overall, the exhibition tells a rise-and-fall story with a dramatic climax that ends in a somber conclusion. It is a must-see exhibition and metaphorically related to our current moment. Cordier notes the timeliness of the exhibition, which opened in Canada before traveling to the United States and France. Each country has experienced the recent rise of its own political disruptor: Justin Trudeau, Trump and Emmanuel Macron. The exhibition is lavish and dramatic —- and I'm not just referring to the art objects. Small details are carefully considered, including walls incised with emblems of bees — the imperial symbol — to an elegant banquet scene divided by scrims featuring a Napoleonic-era etching. Digital projections, including leaves from the Château de Fontainebleau that sway in the wind, re-create a sense of place for Virginian audiences. Such objects as the silver-gilt altar fixtures for Napoleon and Archduchess Marie-Louise's wedding in 1810, which glows and dwarfs visitors, demand attention. The climax is the throne room: red walls, a digital projection of the decorative ceiling in the Tuileries Palace, gilt-and-silk furniture and floor-to-ceiling tapestries. It is an unnerving subversive authoritarian power, best symbolized in a pair of surviving tapestries from the seven-part "The Story of Esther" (1744-46). It seems odd that Napoleon, who considered a woman's purpose as child bearer and clashed with the pope, would have tapestries featuring the coronation of a female, biblical queen in his throne room. But Cordier has a theory. To justify the establishment of a monarchy to the French after a republic, Napoleon needed Esther, who became a monarch to save her people, as a symbol. Nevertheless, his empire was short. Napoleon was permanently defeated June 18, 1815, and banished to the island of St. Helena. Napoleon's last monumental commission, a now-empty large wooden birdcage made by Chinese artisans from 1819-1820, is a fitting representation of his exile. His demise is even more poignant in the final painting of the exhibition. 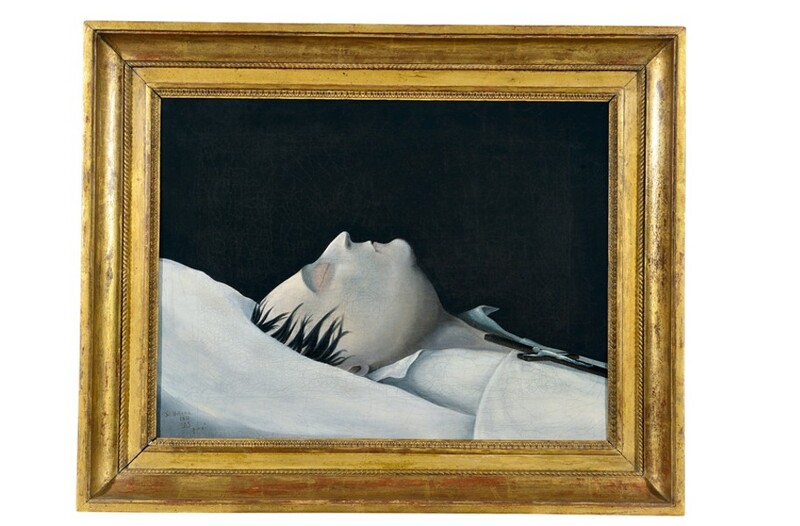 At the end of a narrow, dark alcove, enhanced by a projection of crashing waves and melodic piano music, hangs "Napoleon on His Deathbed" (1821) under a harsh spotlight. 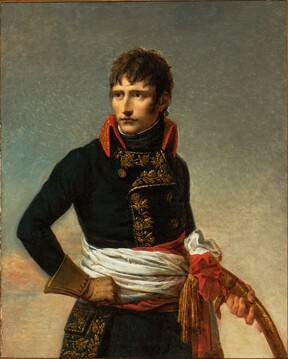 Painted one day after his death, the elaborate costume, lavish fabric, gilt furniture, and expensive decorative arts — the trappings of power — from "Portrait of Napoleon in Ceremonial Robes" (1805) are absent. Color itself is gone in the black and white depiction of a gray figure cloaked by death. English poet John Donne's words, "death be not proud," reverberate in the small space. "Napoleon: Power and Splendor" is on view at the Virginia Museum of Fine Arts through Sept. 3. For information, see vmfa.museum.